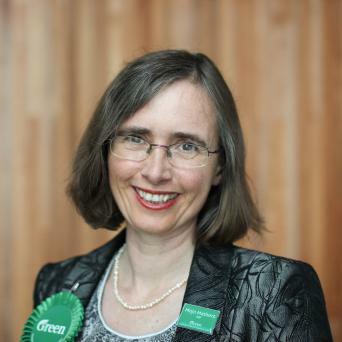 There’s going to be an election this year on Saturday 20 September and the Electoral Commission wants every eligible New Zealander to enrol and vote. They have developed New Zealand Sign Languages videos about the 2014 General Election! Who is eligible to enrol and vote? Note that the above is subject to programming changes. See the TV guide for up-to-date schedules. We have an exciting opportunity for a highly skilled project manager to facilitate the timely implementation of agreed NZSL initiatives by the Deaf Education Centres and identify other significant opportunities to enhance our student’s abilities to access the curriculum through NZSL. There are still a few roads closed from the storm last week. Please check ahead before you drive to avoid delays. 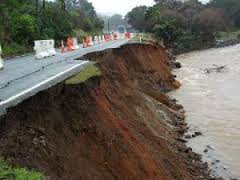 SH1 south of Kawakawa is still closed. Please take detours and note that these are only for light vehicles. 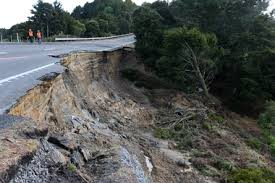 No heavy vehicles on these detour roads, please refer to NZTA for more information. SH12 near Kaihu: one lane is open so expect delays with STOP/GO signs. Other streets might be still closed so if you are going somewhere off state highways, please check with people where you are planning to go. They will know whether the roads are open and safe to use. Photo on left is of SH1 and on the right is of SH12. Whangarei Libraries are celebrating Te Wiki o te Reo Māori. Hunt through the Library for Nga kupu o te wiki - Words of the week. All correct entries get fried bread. Only 1 entry per person. See the flyer or pick up from Deaf Aotearoa notice board. Your Community Relations Officer, Alana Best, will be away on Wednesday 23th July. She will be working on Friday 25th July. 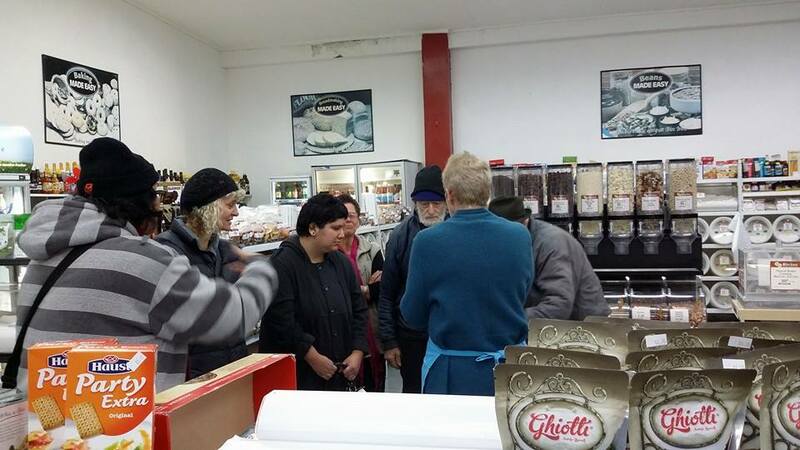 Auckland Deaf Society invite you to join them to open their new community clubroom. Since the 1950s,164 Balmoral Road has been the cultural home for the Deaf and NZSL community of Auckland. Their new community clubroom will give them a platform to continue that great work, and this new flexible and fully accessible space will give them even more opportunities for community activities, events and learning opportunities. Join them to bless their beautiful contemporary new space. Everyone is welcome! Drinks and nibbles provided, followed by cash bar and food available for purchase. RSVP: It will greatly assist them in planning if you could RSVP to events@auckland-deaf.org.nz. Tickets include one pizza, one free drink (beer or non-alcoholic). 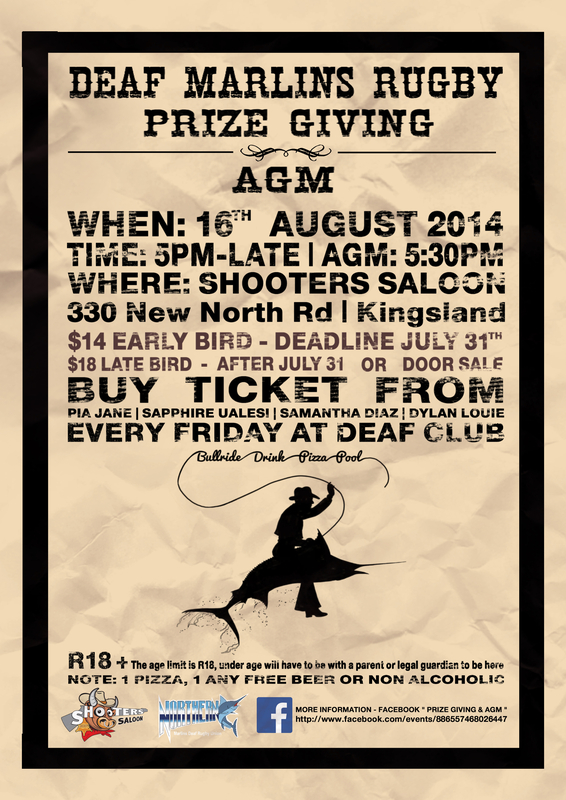 You can buy tickets every Friday at Auckland Deaf Society. See Pia Jane, Sapphire Ualesi, Samantha Diaz or Dylan Louie. This is an R18 event. Anyone underage will have to be accompanied with a parent or legal guardian. To document challenges that people with hearing impairment face in the workplace including those associated with ICT that are not appropriately accessible. Your voice will assist organisations to develop appropriate work and ICT policies to support employees with hearing impairment. Through the dissemination of this study output, you can help society understand the appropriate support for people with hearing impairment to fully participate in the workplace. You will participate in a 1-2 hours interview at your convenient location and time. If you are an individual with hearing impairment, you will be asked about your needs, ICT use, benefits and challenges to participate in the workplace. If you employ an individual with hearing impairment, you will be asked about policies and practices to support employees with visual impairment. For more information please read and download the Participant Information Sheet. ‪ Many individuals, groups, and organisations have benefited from Auckland Council grants, for their projects, events, services, and activities. The council is seeking your feedback on their draft proposal for the Community Grant Policy, which is aimed at making the process for applying for grants more fairer, and transparent. Four community workshops will be run, where participants can find our more about the policy, discuss and ask questions. All workshops will be NZSL accessible with NZSL interpreters booked. However if you intend to go, it is requested you RSVP, to ensure the NZSL interpreters are not cancelled. Visit http://seeflow.co.nz/draft-community-grants for more information, including NZSL translation. This week is the last week you have an opportunity to submit your feedback on previous submissions relating to Auckland Council's Proposed Auckland Unitary Plan. The deadline for further submissions is Tuesday 22 July 2014, 5pm. See https://seeflow.co.nz/fk for more information in NZSL. You are able to make further submissions in NZSL too, via Seeflow NZSL Direct. Reminder: All further submission must be in relation to existing submissions that were received earlier this year. You are unable to make a new submission. Ambulance, Chemist, Counsellor, Dentist, Massage, Nurse, Hospital, Doctor. Was your experience good or bad? Want to know more about your rights? Come and meet your Deaf Advocate, Anna! Deaf Community Member, Robert Cameron and I, had the pleasure of going to the library last Wednesday, to meet with Mojo Mathers – the FIRST Deaf politician. It was set up by “People First” who focuses on supporting those with disabilities. When there is access for a wheelchair to go through a door, a wider door for a mother with a pram for 2 children is also provided, or an elderly person on a walker-frame, or someone on crutches. When there is access to captions for TV programmes, subtitles will provide FREE education to those who are learning English as a second language, pre-school/ school aged persons, elderly. For Deaf in particular, Mojo is exhausting her passion into captioning on TV. Presently, NZ has 24% of TV programmes captioned. This is very low, and in line with Uganda in Africa. Her goal is to push for 100%. 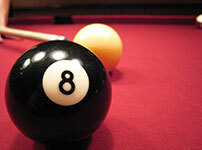 Where: Waikato Snooker & 8 Ball Club, Rostrevor St, Hamilton. 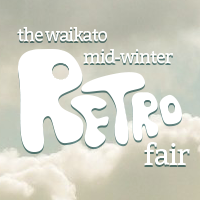 The Waikato's biggest Retro Fair is back for the 4th year running. Stall holders have been in line to get a spot, so we will have the very best available. Stalls will have everything and anything retro from dinner sets to dining tables. There will also be linen, fashion, “Crown Lynn”, German pottery, kitchen ware, jewellery and more. Bring cash and a big shopping bag. 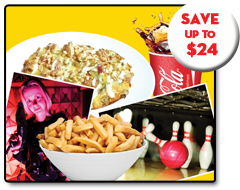 Cost: $59 for food and drink plus an activity package for a family of four! Promotion runs for a limited time, subject to availability. Maximum of two adults permitted. 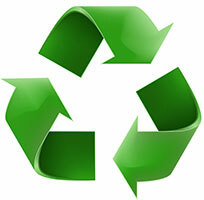 All items must be redeemed on the day of purchase and items are not transferable, exchangeable or redeemable for cash. Additional children are $8 each, additional adults are $10 each. Car parking is for one vehicle and for one entry and exit only, subject to availability. You must validate your parking ticket at The Bowlevard and present your validated parking ticket at the car park booth on exiting the car park. If you are looking to get rid of some things… This may be for you! We want books, old vinyl records, unwanted CDs and DVDs, and we do pick ups. This is a FREE service to help you unclutter your yard, garage etc. 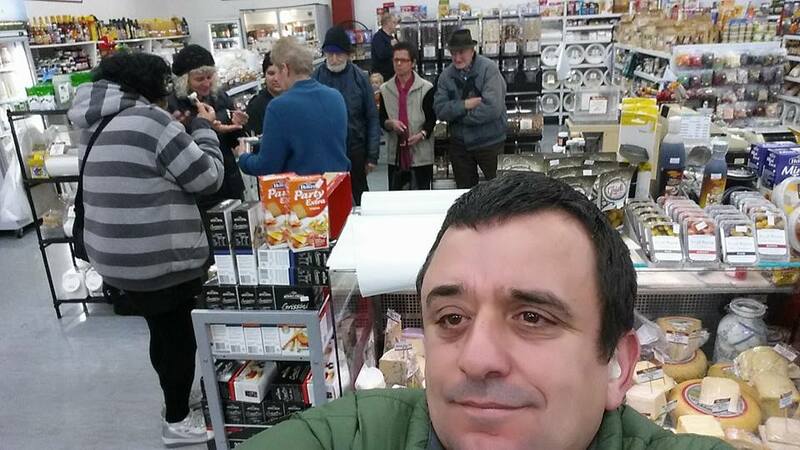 Hank will pick up your old whiteware (fridge, washing machine etc), electrical appliances (microwave, jug, toaster etc), gas bottles, barbeques, lawnmowers, pots and pans, roofing iron, steel car parts and batteries, machinery, tools, bikes, etc absolutely free!!! Sorry, he cannot take wood, plastic glass, old TV’s, old computers or tyres. This event was in the Community Weekly two weeks ago and it was cancelled due to bad weather. This event has been postponed and will be on tonight Friday 18th July. Important Notice: For crowd safety, a section of Chadwick road will be closed from Cameron Road to Greerton Road, between the hours of 5.30pm through to 9pm. As parking will also be limited we would like to encourage you to catch the bus! Routes 1, 2 and 55 are running through to 10 pm. Find your bus route here! Rug up warm, grab your favourite family takeaway and enjoy this free community event! This is an 8 week training programme for City to Surf. The Running/Walking group meet every Tuesday, starting on the 5th August. All fitness levels welcome, join anytime during the 8 weeks. They will have weekly prizes and staff will be on hand for advice. Call 07 578 6363 for more information. This is a live all girl rollerderby. Doors open at 4:00pm. 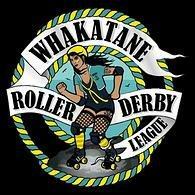 Visit www.wrdl.co.nz for more information. Taranaki Deaf Club outing on Tuesday 8th July in Waitara was enjoyed at Bin Inn. We did some cheese tasting, some cheese were nice. It is the top Bin Inn shop in New Zealand and it is in Waitara! Also we went to another place, the Lodge Floral Studio. Wow it was nice to see flowers. We also went to Garden Shed Chocolate Studio which had yummy chocolate! They showed us how to make Chocolate Passionfruit. It’s so nice. We had lunch and coffee at the studio. We enjoyed our day visiting three places. The photos below and right were taken by Craig Billing. TSB Showplace is proud to present Nick: An Accidental Hero at the Theatre Royal on Wednesday 24 July. This solo show written and performed by Renee Lyons is a sign interpreted performance for the local Taranaki Deaf and hearing impaired community. Nick is an inspiring true story about an ordinary man overcoming extraordinary challenges. Nick Chisholm was a typical Kiwi bloke. In fact, better than typical. A successful architect, star rugby player, fearless mountain bike rider and all round wild guy. So when he was struck with a devastating stroke on the rugby field age 27, which left him physically incapacitated, he could be forgiven for thinking his life was over. He was left with a condition known to the medical world as locked in syndrome and to those who have experienced it as ‘pure Hell’. But throughout twelve years of hard work, fierce determination, the love of his family and the crazy and entertaining antics of his friends, Nick Chisholm not only survived but thrived. He even found the unthinkable - love on the internet. The performance will have you bursting with laughter one minute and reaching for the tissues the next. We have reserved some seats on the left side of the theatre, in front of the interpreter. To access these seats please ensure you use the password SIGN when booking online or quote SIGN when purchasing via our Box Office. To access tickets online, enter SIGN into the offer code to unlock these seats, and then select the tickets you wish to purchase. For further information about the performance, please contact Jane Manning on 06 759 6712 or email tsbshowplace@npdc.govt.nz. This accessibility performance is generously supported by funding from Creative New Zealand and TSB Community Trust. Time: 9am-4pm Monday to Friday until the end of July. Organised by the New Plymouth Opera House Friends Trust, with proceeds going towards special projects at the TSB Showplace, the annual Book Sale will once again have more than 70,000 books on offer. Now in its 25th and final year, the book sale will be held back at the TSB Showplace where it all started. The most popular sections at the book sale are novels, magazines, as well as children’s books. There are also National Geographics, hobby books covering topics such as gardening, cooking, health, sports, travel, cars and religion. Students will find textbooks and the New Zealand Nearly New and Special Interest sections always reveal some special finds. An extensive music section offers CDs, DVDs, sheet music, tapes and records, and in recent years the book sale has added puzzles, games and a bric-a-brac section. Dates: Friday 8th and Saturday 9th of August. PODC would like to welcome all families in Taranaki with Deaf/Hearing Impaired children to a gathering on the above date. There will be a visit from Bernie Mulcahy-Bouwman, Principal of Van Asch Deaf education Centre. This gathering is a great opportunity to meet Bernie the principal of Van Asch Deaf education Center in your own region. A chance to listen, talk and ask any questions you may have about your child’s support and education. RSVP by Tuesday 4 August by email to podctaranaki@windowslive.com. PODC Taranaki Inc would like to remind families that our meetings are family friendly and you are more than welcome to bring your children along to the meetings. We try to keep the meetings short, there is a side room where the children could play, parents can bring along any activities/snacks to keep them busy. Madison Davy has offered her services to entertain/supervise the children and will be at the meetings. PODC would like to see more families attend the meetings, this is a way to keep in touch with information resources and activities. See you there at the next meeting! Join Te Reo o Taranaki for fun sessions around this year's Māori Language Week these 'Te Kupu o te Wiki' (Word of the Week). Taking a lead from Michael Parekowhai's Te Ataarangi sculpture outside the Puke Ariki Library, these session will use colourful rākau (or Cuisnenaire rods) as an introduction to the Te ataarangi method of learning te reo Māori. All welcome. The Deaf Access Centre in Hastings is available to the Deaf community. We have free access to internet, use of Skype, access to community computer if you want to type something, look for work or check your email. We have also have available Deaf Aotearoa resources, information, DVDs plus more. For more information please contact Lee Bullivant. NZSL Interpreters will be there. Please bring a plate of food to share for pot luck lunch. Please do let the other Deaf women know about this. The Japanese Association of Napier is organising a festival to celebrate its formation under the umbrella of the Japan Society of Hawkes Bay. The event will include items of traditional Japanese dance, as well as a demonstration by two Kendo exponents of traditional Japanese fencing. Organisers have also obtained a large Japanese Rice Cake maker, and there will be treats for visitors and members of the public. A gold coin donation is required. Club night is open to anyone, bring along your friends and family, have a game of pool, darts or watch the sports on the Sky TV! They have four different courses: 3km, 5km, 10km and 15km. Starts at the Manawatu Striders Clubrooms at Manawaroa Park. Walkers begin at 9.00am, Runners at 9.30am. At the end of your achievement there will be a banana, cup of tea and biscuits! Come along and check out the stalls for quality crafts, new and preloved. Grab something to eat and let the kids enjoy the playground and sandpit at the playcentre. If you wish to have a stall, it's $10. You can contact Wen via text on 021 184 4027 to enquire about booking your spot. You can now enjoy up to 30 minutes free WI-FI on your electronic device when you visit the plaza. Connect your device to the Tomizone signal shown on your wireless network list. Choose the way you would like to get online. Maximum of 30MB and one free session per day. Wellington Deaf Society is having a Special General Meeting this Sunday to have a discussion about the future of the clubroom. Everyone is welcome and share your say, but only Deaf members of Wellington Deaf Society are entitled to vote. They need your support! Remember that the club is your second home! Light refreshments and interpreters will be provided. Wellington Deaf Society is turning 76! Come along and join the celebrations and wish them a very happy birthday along with canapés (finger food). See flyer for more information and RSVP to events@wds.org.nz if you want to go. Bring your family along to this action packed event! There will be fun activities for the whole family to participate. Please bring your own lunch, and be sure to wear comfortable clothes. The bar will be open to sell non-alcoholic drinks. Please see flyer for further details of this event. Ko wai au? Who am I? See my voice? Nau mai e te iti, e te rahi kia kite atu i ngā kōrero whakaohooho nō ngā rangatahi tokoono nei. Ko Wai Au – an exciting exhibition presented in Te Reo Māori, New Zealand Sign Language and English showcasing 6 inspiring Māori rangatahi. To celebrate Māori language week Te Tāhuhu o te Mātauranga (Ministry of Education) is hosting an exhibit. This exhibit is a product of a unique research project initiated by North Carolina State University and Victoria University of Wellington, empowering Deaf Māori rangatahi to communicate with others so that schools and communities had a better understanding of their access and communication needs, and their aspirations as young people. Come have and look and be inspired! Look at your leisure, with the 6 rangatahi here for a presentation at 1pm in Room 3.25/6. There will be time for any questions around the exhibition, and a lucky few will win some cool prizes at the presentation too! To RSVP please send an email to karepa.wall@minedu.govt.nz. Nau mai, haere mai - come down to Kilbirnie Recreation Centre, for a gold coin entry you can put on your skates and enjoy a night full of fun activities for the whole family. Some skates available for hire. Bring your own if you have them. Sorry no bikes or skateboards but scooters and tamariki tricycles are welcome. You can be warm and cosy at home this winter, and we’ll show you how. Our experts will guide you through practical solutions for common housing problems like condensation, mould, insulation, draughts and large heating bills. We’ll help you find easy, low cost ways to solve many of these issues, and give you up-to-date information on the best services and resources available in your area. Please bring a shared pot luck lunch dish and your own drinks. We hope to see you all there. Let Rachel know if you require transport. Where: Theatre Royal 78 Rutherford St, Nelson. The City of Nelson Highland Pipe Band turns 90, with a Ceilidh style concert that is a feast of all things Scottish - from traditional full band performances to Celtic singing, dancing and contemporary performances. Expect to hear piping solos and duets, drum salutes, traditional tunes such as Scotland the Brave and new tunes like The Red Fox. The band was formed in 1924, and this year celebrates its strong and long-standing presence in the Nelson community. Brief Description: Learn the language and improve your communication with the Deaf Community. Brief Description: Learn more of the language and improve your communication with the Deaf Community. This is the 3rd course of instruction offered for those who've completed levels 1a & 1b (formerly known as 1 & 2). Brief Description: Learn more of the language and improve your communication with the Deaf Community. This is a course of instruction offered for those who've completed levels 2a or have equivalent experience in Sign Language. Your local Canterbury Deaf Youth are having a pizza evening to raise the funds to support their youth activities, events and their opportunities. Come and join Canterbury Deaf Youth’s event and enjoy an evening meal. The Recreation and Sports Unit strives to provide great customer services to all our customers. If you or someone you know with a disability uses any of our centres, we would love to know what you think. Your feedback will help us to improve and provide even better services for disabled people. Please click here to complete the survey, thank you. Hard copies of the survey are at the front desk at any Recreation & Sport Centres, or at our office – please ask Victoria if you would like any help with the survey. There are a lot of events during every month at all Waimakariri areas for your family, friends and children for a day out – see a flyer or http://www.visitwaimakariri.co.nz/new-zealand/events/. Do you kids or yourself like getting dirty, wet and having a good laugh, this may be for them or you! It is a perfect wet weather activity – 80 metre plastic sheet slide down a steep hill and across the flat – speed, danger and possible injury. Bring wetsuit if you have one, a change of clothes and a towel. We have a beautiful native bush to explore – see if you can find the ancient big Kahikatea, Totora, Matai, Kanuka, Ti kōuka and Harakeke. Come down and visit the the Navy's Inshore Patrol Vessel HMNZS Rotoiti. Meet the crew and view the ship. Social night on the 25th July is cancelled. Michelle is on annual leave Tuesday 22nd July. She is not in office to take appointments. The next course will be about technology: understanding internet data, mobile data services (e.g. 2G, 3G or 4G), smartphones (e.g. iPhone or Android), tablets (e.g. iPad or Android), broadband providers and Ultra Fast Broadband (UFB). Information from NZ Relay covering topics including: TTY Relay, Internet Relay, Video Relay Service (VRS), Mobile Text Relay (MTS) and CapTel. This is an exciting course that will make you tech savvy and understand your devices and how they work and what not to do! If you have any preferences on times/dates please let me know and I will organize to suit the majority. Times and dates will be confirmed in the coming weeks.